Over the decade and more since Jamie Cullum first broke through, the UK jazz scene has seen the emergence of a new generation of fine new male jazz singers, each with their own particular slant on jazz vocals. 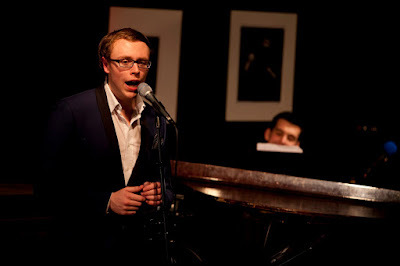 Alexander Stewart, AJ Brown, Theo Jackson and, with his second album out this autumn, Ben Cox. All of them have contributed greatly to the health and artistic strength of the genre. Cox debuted last year with This Waiting Game, a remarkable first departure by a singer who was still a student at the time, certainly in the way that he effortlessly conveyed the atmosphere and life of a well-worn standard for example like A Nightingale Sang in Berkeley Square, and in the confidence and sheer style he brought to his duetting with Claire Martin, one of the album’s highlights. Cox’s new album Round and Round is released on 14 October and continues his songwriting collaboration with co-writer, pianist Jamie Safir. Cox began this interview by explaining how he first became interested in jazz and what attracted him to the music. Home for him was full of music. “My grandma was a fantastic pianist and teacher who taught my mum to play, and my two older brothers also played piano. I shall always remember those long car journeys, when mum would put on Carole King’s Tapestry or a Frank Sinatra album.” He says that he was always going to pursue a musical career even if singing was more of a last minute discovery. Round and Round is released by Cinnamon Records. Upcoming dates by the Ben Cox Band include The Cinnamon Club, Altrincham on Friday 14 October, and the Pizza Express Jazz Club, London, on 17 October.